With a foreword by James S. Donnelly, Jr., Professor of History, University of Wisconsin. This publication focuses on a single community allowing the author to highlight the cumulative and shattering impact of disastrous government relief policies on a population rendered prostrate by repeated failures of the potato harvest. 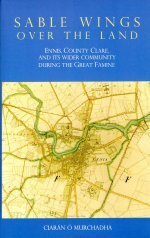 He outlines in turn the shambles of the public works, the loathed soup kitchens, and most horifically the appalling disease and mortality that occurred both inside and outside the Ennis Union workhouse and its auxiliaries after 1847. Among the topics which this book illuminates are a huge upsurge in violent and non-violent crime, desperate individual attempts to survive by stealing, and collective attempts to prevent the outward movement of food supplies. The brutal outrages of secret societies, and harsh judicial reaction also feature, in addition to the unsympathetic and often indifferent attitude displayed by officials at all levels towards those whose misery they were appointed to relieve. Important new insights are offered on a wide variety of other topics such as corruption on the boards of guardians, the bizarre election campaigns of 1847, the Special Commission of 1848 and the hangings which followed it, and a merciless campaign of evictions carried out by landlords in the district. Exhaustively researched, and compellingly written, this book is sure to set the standard for future work of a similiar kind.